Publicity Stills of "Just Like Heaven"
When David sublet his quaint San Francisco apartment, a pretty young woman named Elizabeth suddenly shows up, adamantly insisting the apartment is hers. David assumes there’s been a giant misunderstanding…until Elizabeth disappears as mysteriously as she appeared. Convinced that she is a ghost, David tries to help Elizabeth cross over to the “other side.” But while Elizabeth has discovered she does have a distinctly ethereal quality—she can walk through walls—she is equally convinced that she is somehow still alive. As Elizabeth and David search for the truth, their relationship deepens into love. Unfortunately, they have very little time before their prospects for a future together permanently fade away. If there’s one thing that’s hard to beat, it’s romance. Romantic comedies are a favourite with the general audience although critics may feel otherwise. Couples enjoy them as do those who are getting into a relationship. Afterall, a romantic comedy could just be the right way to get things started, if you know what I mean. Sometimes, romantic comedies allow the audience to defy logical reasoning as in the case of Just Like Heaven. David Abbott (Mark Ruffalo) is a landscape architect who has just moved into a new apartment previously occupied by physician, Elizabeth Masterson (Reese Witherspoon). Soon, Elizabeth starts appearing and demanding David to leave the apartment. In turn, David starts to assume that Elizabeth’s a ghost and demands the same in return. Is there a possibility that love can blossom amidst the events that would occur next or would it be, pardon the pun, quite dead? Together, the duo set off to discover the grave nature of her current existence. In doing this, they soon realize that David is the only one who can see Elizabeth and thus, increasing the complexity of their quest. From the beginning, the story has its flaws. Elizabeth has the ability to walk through walls yet she is also able to sit on a park bench and leave a depression on a bed. While continuity is the most menial of problems with the story, the script has redeeming qualities. It doesn’t veneer into something that’s too sappy, vomit-inducing melodrama or over-the-top cheesy. Rather, it has a witty nature and affable charm. Reese Witherspoon glows in her portrayal of Elizabeth that you would probably nod in agreement if she had proclaimed herself to be an angel. Witherspoon also brings an aggressive nature to her work-minded character who appears calm but is also a control freak as David would later learn. Cue questioning a man about the existence of a coaster and how in failing to use one would cause rings on the coffee table. While Witherspoon seems comfortable accepting roles in films of the genre, she has chosen prime roles in the seductive Cruel Intentions, cult-favourite American Psycho and will be playing Johnny Cash’s wife in the upcoming Walk The Line, which would at least garner her an award nomination. She is slowly making the transition from cute chick to award winner. 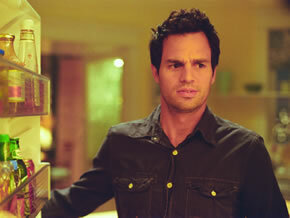 While his story starts from quite the opposite, Mark Ruffalo has started to dabble in romantic comedies. In both 13 Going On 30 and Just Like Heaven, Ruffalo proves that he has comic timing and an oddball nature despite his comfort in playing a troubled sibling or spouse in dramatic fares like his breakthrough You Can Count On Me and We Don’t Live Here Anymore. His ability to switch from the lazy slob to the goofball to the despaired as David in Just Like Heaven, brings a promising amount of pseudo-gravitas to the film. Not like that’s entirely a bad thing. David and Elizabeth both discover that their similarities occur at the most polar of opposites (they can be quite despondent but not at the same time). But it is both Witherspoon and Ruffalo’s strengths and chemistry which make this intricate attraction formidable and real. They are backed by an under-used supporting cast such as Jon Heder (of Napoleon Dynamite fame) who is destined to be the new poster boy for dudes around the world, Donal Logue (the father on Grounded For Life) who could possibly try his luck at being a King of Comedy and Dina Waters as Elizabeth’s sister who provided both humour and grief. The only exception to the cast would be Ben Shenkman’s “evil” doctor. This role is quite a farcical one, in which he appears stiff as compared to his brilliant turn as a troubled gay lover in the award-winning, Angels of America. The music used in the film was like a supporting character in its own. In the mould of Cameron Crowe and Quentin Tarantino, the director, Mark Waters seems to have an eye, or in this instance, ear for the right music. He chose soothing fare like the titular track, Just Like Heaven by Katie Melua, the fast-tempo, reggae-inspired, I Put A Spell On You by Screamin Jay Hawkins and Beck’s mellow song, Strange Invitation. As Elizabeth and David progress in their quest, the prospect of love appears despite Elizabeth being in her “lightness-of-being” state. As they question the improbable, in the final act, a situation, which would naturally seem like a fish out of water in a movie of this genre, arises and ethics are challenged. The issue was tackled head on and the ethical dilemma faced all while a frenzied distraction occurs. In doing this, the flow of the film was not disrupted and the mood remained gentle throughout. It’s quite charming to observe how Mark Waters tackled a sensitive issue, masking it with a cheerful demeanour. I almost cheered when for a moment; I thought I would be genuinely surprised by an unpredictable ending. However, as most films would have it nowadays, it opted for the traditional Hollywood cliché. For a film that forces you to suspend disbelief, leave your sense of logic at the door. And although romance with the afterlife might not particularly be your cup of tea, if you’re a romantic at heart you’ll enjoy the film. Just Like Heaven injects a dosage of the saccharine into your heart and would probably force you to shed a tear or two.